If your crunches leave you with shaking abdominal muscles, it's a good sign. Muscles develop a shake when certain groups of muscle cells are fatigued and drop out of service. Stopping the shake can be as simple as giving your muscles a break to recharge. You can also use the shaking in your abs as an indicator that you're really pushing your muscles to their maximum. Combining multiple ab exercises into a routine can help develop your core faster. Exercises like the forward plank, side plank, modified crunch and bird dog are great options. Work on different repetitions and combinations to work different muscle groups. 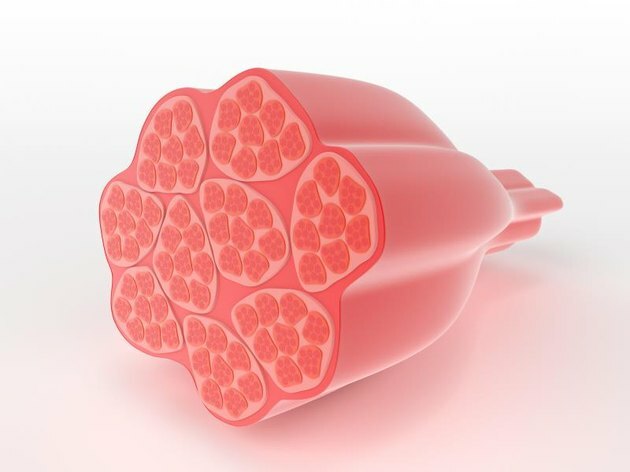 Your muscles are made up of bundles of individual cells. When you perform a crunch, these cells work together — mostly. Each individual muscle cell is part of a small group of fibers connected to your spinal cord through a neuron. The individual nerve and the muscle cells it controls comprise a single motor unit. The motor units in your abdominals might be comprised of thousands of individual muscle cells. These motor units don't work together perfectly. When you subconsciously tell your muscles to perform an action, like a crunch, some motor units will fire immediately and contract, while others may not. As the active muscle groups become fatigued, they begin to cease functioning. After several crunch repetitions, you'll notice that shaky feeling getting worse. At the beginning of your exercise, there were enough overlapping motor units that your crunches looked and felt smooth and synchronous. However, as more and more motor units become fatigued, you'll start to shake more. Since fewer of your motor units are firing, the action of your crunch is less precise and less smooth, creating that shaking sensation. A fatigued muscle cell isn't necessarily out for the count. According to a Scientific American interview with Loren G. Martin, professor of physiology at Oklahoma State University, researchers believe it may be the neuron itself that is responsible for fatigue. "Most of the fatigue probably occurs within the spinal cord at the level of the motor nerve cell and its neural connections," says Martin. That's because the chemicals responsible for carrying the "message" your brain sends to your muscle cells cannot be created to keep up with long bouts of activity. As the signal begins to waver, these motor units drop out temporarily. "After adequate rest, the fatigued motor units return to normal," says Martin. Read More: What Are The Signs That Your Core Muscles are Weak? If you've got a shake in your abs during crunches, there's no compelling reason to try and eliminate it. That shake lets you know when you're getting the best workout your abs can handle. Over time, with a dedicated ab workout routine, you should see the number of crunches you can do without shaking increase. However, you'll still eventually get that trembling, if you've pushed yourself enough. If you want to eliminate the shaking so you can continue your workout, try taking a break and rehydrating your body to give your motor units a chance to recharge. Pushing yourself after you've begun shaking can lead to a strained abdominal muscle. If you feel sharp pain along with shaking, stop immediately. Overexercise can pull and tear a muscle, causing a painful strain that could take several weeks to recover from. Listen to your body and keep your workout within your ability level. Why Are My Legs Shaking Post-Workout?